Japan's electric-cars are moving ahead at full-throttle. 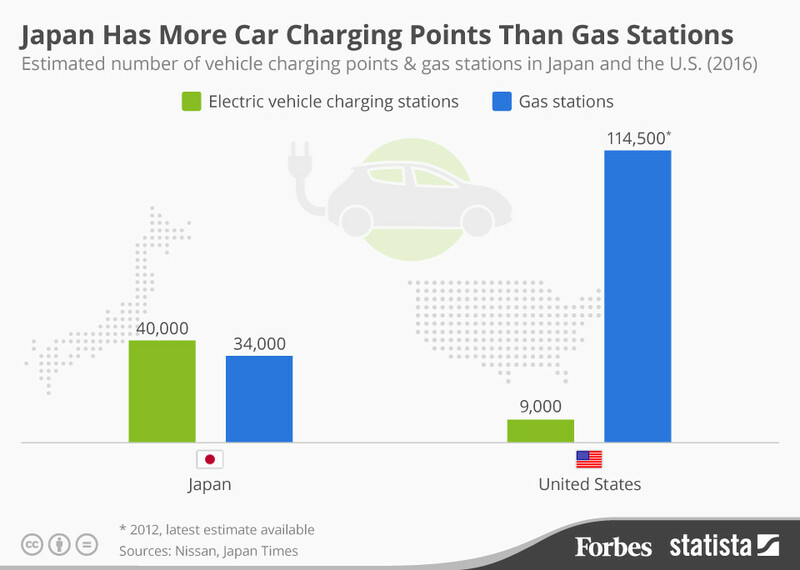 There are more electric car charging points in Japan than petrol stations, according to Nissan. The Japanese car manufacturer reports that the number of charging points in the country has surged past 40,000, compared to fewer than 35,000 petrol stations. However, this number does include points in private homes, as well as the nearly 3,000 publicly available rapid charge points. But with the growth of the sharing economy and the rise of sites like PlugShare.com, owners of private charging points will be able to make them available to multiple users. As the electric car market grows, the infrastructure to support it has to grow as well. “An important element of the continued market growth is the development of the charging infrastructure,” Joseph G. Peter, CFO at Nissan, is quoted as telling analysts in a conference call. As the charging networks expands, electric cars are set to become a more viable option for drivers around the world. Mary Barra, CEO of General Motors, sees electric cars as one of many technological advances set to change the auto industry. She believes this change will happen at an unparalleled pace. The industry is also reacting to these infrastructure needs. Tesla has its own network of high-speed charging points. VW and BMW have also teamed up to build a network of charging stations in the US. The news from Japan represents a significant milestone. With generous subsidies in some countries, new and improved battery technologies and charging points popping up all the time, it may not be too long before electric cars become commonplace.